Reese's Peanut Butter Cups Minis - 18 Count. One of the most popular candies of any generation in a convenient 5.3 oz bag. 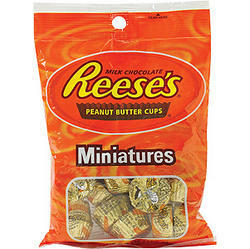 Each bag contains approximately 18 individually wrapped Reese's Peanut Butter Cups Miniatures. Yes, we love them too! Enjoy.